Browsing through the Newspaper You Can Trust the other day, I discovered that those little paper stickers you find on the tops of wine bottles are more significant than I previously thought. It seems that if they’re blue, the wine was produced and bottled in another country and then imported into Thailand. However, if the sticker is a pale orange colour, then the wine was manufactured in Thailand. Now as you may know, there are only a handful of wineries in this country and some of them are actually making world-class wines that have won prestigious awards. The trouble is, they are surprisingly difficult to lay hands on and for various reasons, they also tend to be a bit expensive. 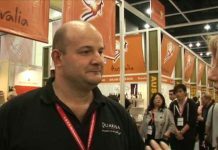 This is perhaps why Thailand’s so-called fruit wines have come to dominate the market place. You’ve almost certainly come across the range of wines produced by Siam Winery which includes Mont Clair, the work-horse wine of almost every cheap bar and restaurant in town. There are others, such as Mar Y Sol, Berri Estates, and one of the other top sellers, Peter Vella. The labels of the Peter Vella wines trumpet their Californian origin and you’d be forgiven for assuming that they are actually made there. However, the orange sticker gives the game away, because they’re actually made in Thailand. 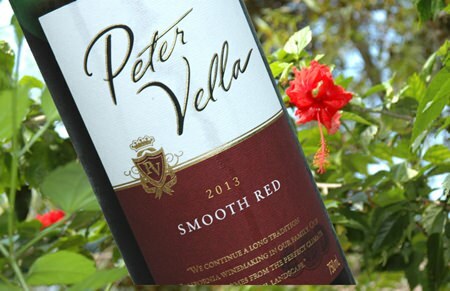 Peter Vella wines are made from Californian grapes and they’re imported in bulk. Then they’re carefully blended with small amounts of local wine and other parts of local grapes grown in Thailand. This is why, in comparatively small print, the label states “Fruit Wine.” It’s also why they can keep the price so low. Anyway, I’m not complaining, because with our staggeringly high taxes on wine Siam Winery fills a much-needed gap in the market. Incidentally, the Peter Vella winery actually exists in Modesto, California where they produce commercial wines for the home market, but if you buy a Peter Vella wine in Thailand, it will be fruit wine. Similar wines are available in three-litre boxes and they works out a whole lot cheaper if you’re running a bar or organising a social gathering. The wine also comes in handy quarter-size bottles, like those you sometimes see on aircraft. This tiny bottle is known as a split or piccolo and contains 18.75cl, just about enough for two modest glasses. The bottles come with screw caps, known in the trade as Stelvin closures, and they save you the bother of faffing around with a corkscrew. Mind you, the bottle I encountered required a vice-like grip on the screw-top and although – as everyone knows – I am a butch and muscular type, it took a great deal of physical effort to open it. The dogs were quite taken aback to hear such rich and colourful language. The name Classic White doesn’t convey a great deal of information except that the wine is white and er, classic, whatever that’s supposed to mean. You can also get a wine called Fresh White, which of course is white and fresh. Then there’s the Classic Red, the qualities of which I shall leave you to work out for yourself. 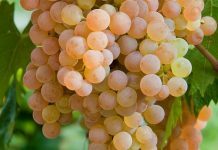 The Classic White is a pale yellowish colour and looks a bit like a Chardonnay. As it turns out, there’s some Chardonnay in it somewhere and you’ll pick up the “tropical fruit” aromas as soon as you give it a good nosing. The smell is quite a bit more interesting than I expected with reminders of honey and lemon. In an odd way, the aroma strikes me as somehow a bit artificial, but I suppose at this price, we’re lucky to get a decent aroma at all. The wine turns out to be off-dry, although experienced wine drinkers would probably consider it slightly sweet. It has a very soft mouth-feel with a decent dollop of fruit and just the faintest touch of acidity to hold the body in shape. There’s quite a decent fruity finish too. This is an unashamedly easy-drinking commercial wine but I have to admit that it’s expertly made. It’s clearly aimed at the popular market and I’m sure that many of my Thai friends would enjoy this wine because of the slight dash of sweetness that is so popular in Asia. The text on the label says that you could drink it “with pasta in white sauce, seafood or Thai food”. I’m not convinced about the first suggestion, because I think pasta needs a good dash of acidity or tannin to give a lift to the rather bland texture. At least the name of this wine gives a clue to what you might expect. I’d guess the year is shown to add a bit of gravitas because wines of this type are nearly always blended for consistency, year after year. But at least you know its age. Like the Classic White, the aroma gives the impression that the wine is more expensive than it actually is. It’s a fruity, jammy “come-and-get-me” sort of smell but after a few sniffs it begins to feel a bit one-dimensional. But I have to keep reminding myself that this is a bargain basement wine, and not the kind of thing that one swirls, sniffs and pontificates about. Having opened the bottle, which was less of a challenge than the previous one, the wine is certainly smooth. 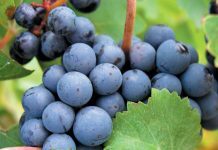 If you are the type who enjoys easy-drinking fruity reds, soft on the palate and hardly a trace of tannin, you may well find this wine extremely attractive. Compared to the Mont Clair reds, this is quite a bit softer with more obvious fruit on the palate. There’s even a very slight hint of sweetness. At around 11% alcohol content, both wines would probably be at their best as light-hearted party gluggers to accompany conversation and general merriment. Assuming of course, that you manage to open the bottles.